The rule is a question of culture, the exception a question of art. Everyone speaks the rule: cigarettes, computers, t-shirts, tourism, war. No-one speaks the exception. It cannot be spoken. It can be written: Flaubert, Dostoyevsky. It can be composed: Gershwin, Mozart. It can be painted: Cezanne, Vermeer. It can be filmed: Antonioni, Vigo. Or it can be lived, and is thus called the art of living: Srebenica, Mostar, Sarajevo. It is part of the rules to want the death of the exception. It is the rule of European culture to organise the death of the art of living. But on its appearance this didn’t seem the case at all. On first release, For Ever Mozart was variously described by French critics as “Godard’s most satisfying film in a long time” (Le Monde) and as a “masterpiece” (Cahiers du Cinéma) (2). So what has happened in the 5 years since For Ever Mozart? From being hailed as a masterpiece on its appearance to its classification as the runt of the extensive Godardian litter, whereby even as staunch and perceptive a supporter as Nicole Brenez can dismiss the work out of hand, what has changed? In the best of the recent books on Godard, the Michael Temple and James S. Williams edited The Cinema Alone, Temple and Williams summarize the auteur’s recent preoccupations with cinema and film history as follows “[they are] quite standard fare: the purity of origins, the infinite promise of invention, the compact between Méliès and Lumière, document and fiction, the betrayal of cinema’s popular mission and scientific vocation by Hollywood and spectacle, the death of the silents at the hands of the talkies, the ethical irresponsibility of cinema at crucial moments of contemporary history (Auschwitz, Hiroshima, Vietnam, Bosnia), the cancerous spread of global television, the slowly successive deaths of distinct national cinemas, and so on.” (3) When it becomes acceptable for supporters of JLG to take it as given that he has been serving up standard fare (even in terms only of his own work) these past years, one begins to suspect that there has been a power shift and that critics now believe themselves to be in control. Is this why For Ever Mozart is virtually ignored in The Cinema Alone? I would suggest that this is not unrelated to the print-driven ‘Godard Renaissance’. Could it be that it was only by way of the castigation of For Ever Mozart that the oeuvre could be rendered creatively complete and thereby manageable, a manoeuvre without which there would be little hope of critics ever “catching up with Godard” (to use Jonathan Rosenbaum’s prescient phrase) (4). The completion of the video project Histoire(s) du Cinema in 1998 merely served to underline this sense of an achieved body of work. That there has now been 5 years between Godard features is surely the effective fallout of this perverse state of affairs. Now the question that must be asked is: if in terms of ideas we have been served up ‘standard fare’ for several years, would we be able to recognise a new Godardian idea if we encountered one? Let’s consider what’s being going on in these recent features. 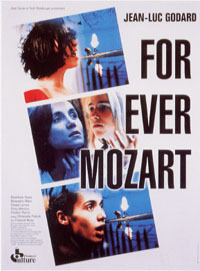 The genesis of For Ever Mozart is typical of Godard. Creating images is a painstaking process. (Not long ago, in an explicit riposte to the Tarantinos and Rodriguez’ of the world, his reply to a student at a New York seminar seeking advice on filmmaking was: “go ahead! It is easy to make films. If you have only one dollar then make a film for one dollar. It is creation that is difficult, not making films.”) As JLG/JLG put it, glossing Pierre Reverdy, “the image is a pure creation of the mind. It cannot be born of a comparison but from drawing together two distant realities. The more the ties between these realities are distant and right the stronger the image will be. Two realities with no ties cannot be usefully drawn together. No image is created.” With For Ever Mozart, Godard drew on three distinct embryonic projects, namely, an homage to Portuguese poet Fernando Pessoa; an idea borrowed from a newspaper article by Philippe Sollers about staging a play in Sarajevo; and a project whose point of departure would have been a Keith Jarrett concert. Godard set out knowing it would be the film in construction which would tie all of these elements together. By combining these preoccupations with his desire to express his disgust at the attitude of French intellectuals to the war in the ex-Yugoslavia (which he saw as exemplifying his aforementioned contempt for the current state of European culture), Godard, according to Serge Toubiana, managed to forge the most just and accurate political film of recent times. The two main narrative threads (the spectacle and the journey) inevitably recall Le Mépris (1963) and Les Carabiniers (1963) respectively, and allow Godard’s bodies to recover a liveliness absent from the preceding few films. “It may be a depressing film” writes Olivier Seguret “made in honour of those who have shed blood, but it depends also on a mad physical exultation.” (8) Its images are “incandescent” making For Ever Mozart “resonate with lively harmonics.” JLG’s response to the barbarity of war and to avoid turning it into cheap spectacle was in part to return to choreography, mime and dance in order, Seguret continues, “to transfigure the victims of war, to lend their bodies a poetic freedom; these characters dance on a volcano. Faced with death they attain an ultimate grace which saves them from the abyss.” (9) Now, from a creative point of view, this is where the importance of For Ever Mozart lies. What is novel in the film is its intensification of a new linkage of ideas fashioned for the first time in Nouvelle Vague (1990) and by all accounts taken even further in his new opus Eloge de l’Amour (2001): a concern with the human body as the locus of new forms of resistance to ‘culture’, visualised through a series of unprecedented relations between these bodies and nature. Throughout the ’80s and ’90s, at a time when the concept of the postmodern sublime dominated cultural studies, JLG was elsewhere, refining a concept of the beautiful that would lead to the ‘turn’ to nature with Nouvelle Vague. Seeing things differently (as ever), Godard realised it was by working through the idea of the beautiful that truly creative things would begin to happen. Not the Kantian beautiful wherein disinterest before the art work relieves the spectator of his or her habits of thought, but a kind of biopolitical ethico-aesthetic notion (when asked some time ago what it might mean to be ‘Godardian’, the filmmaker replied that it would be “to defend an ethics and an art”) whereby nature would have to be re-invented by cinema and bodies constituted by way of relinquishing their ‘habits of habitation’; both human subjects and the earth would be born in a single movement of life. These are characters who express “the dynamism of life caught in its fugitive effusions” (10) (to transport Adrian Martin’s superb phrase from another context). Godard’s turn to Pessoa for For Ever Mozart was an inevitable step to take in following this line of experimentation. The Portuguese poet’s ‘transcendental poetics’ (analysed so well by Jose Gil in his Fernando Pessoa ou la metaphysique des sensations) (11) sought to describe the emergence of the sensing subject out of an impersonal field of sensations, the being of the sensible, and the passage of this singular subject to a universal and shared experience via a reflexive intellectualizing of sensation. In this sense For Ever Mozart is the key to what is new in Godard these last years; he has forged a middle ground between a poetic and a philosophical cinema by marrying Pessoa and Kant (the AND method so brilliantly isolated by Deleuze). Forever.Mozart, the beautiful exception; or nature-sensation, both singular and universal. Jonathan Rosenbaum, “Eight Obstacles to the Appreciation of Godard in the United States” in Jean-Luc Godard: Son + Image 1974-1991, MOMA New York 1991 p. 202. Fergus Daly is the director of Experimental Conversations (2006).